I know if you are reading this, chances are that you either have been in many relationships, been married once or twice and have had your heart broken. It sad, but breaking up and starting new relationships or marriages are now just a part of life that we all have to get used to. Not so long ago, it used to be that men or women would marry their high school sweethearts, have children with them, buy a house together and stay married to them until one of them died. That used to be the norm and divorces or multiple marriages used to be things that were rare or unheard of. Now fast forward to the present, divorces are like driving through a fast food chain and multiple marriages are now in fashion . But one thing still holds true even in today's time, people are still hurt when their spouse cheats or when they are unfaithful. In today's time its very easy to find out if you have an unfaithful spouse, because of the technology and the Internet. Today its a known fact that some television shows and even some social websites encourage cheating. There are thousands of websites where husband or wives that are looking for an outside affair can find one with just a click from their mouse. 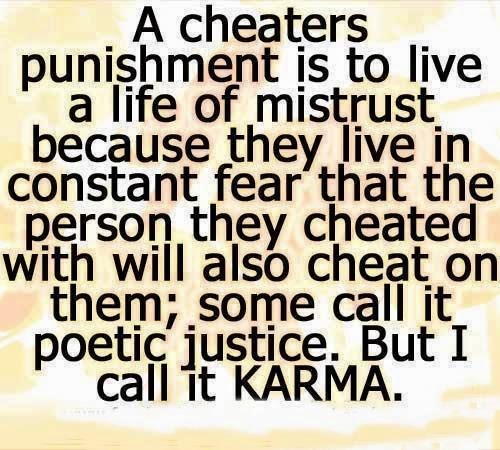 There are now even reality shows such as Cheaters and other's that exposes the cheater or the unfaithful. While those show expose Cheaters there are other shows that encourage it. The question I have for you today, What Would You Do If You Caught your spouse, husband, wife or partner cheating, texting or sexting and then having an outside relationship with a man or a woman other than yourself? I don't mean finding out through a family member or friend, I am also not talking about finding a telephone number, sexual picture, clothing, text or an e-mail linking them to an affair. What if you had a feeling or a suspicion that your man or woman was cheating? What would you do or how would you react? How would you handle coming home after hard day of work or after school, driving up into your drive way and while you are there you notice a strange car in your drive way? Wouldn't you be nervous when you walked into your home or apartment, knowing that your spouse or mate was in there cheating? What would you do if you walked into the bedroom and they were still in the act of making love? How would you react or how would you take it? This has happen to me three times in my lifetime and I will share my story with my readers after I get some reactions from some of you. It will be tittled, Busted!! After I was cheating on by one of my ex-girlfriends it changed my life forever and any perception or opinion that I had before my heart was broken, was forever changed. Now I knew for a fact that women, lie, cheat and steal also. Men weren't the only dogs out there , in fact some women cheat so well that, they are real pros at it. Think about this subject and answer this real life question, What would you do if you, man, woman or lover called out someone else's name or What Would You Do If You Caught Them Cheating? Until then write in and express your thoughts or opinions on the subject. WOW! What a scenario you set up. Well I have never experienced this, but back in the day if it would have happened I know I would have down something that would resulted in me being in prison. I say this because I've done some things to my ex husband with just see him with another woman. That time in my life in my 20s no one had ever "done me wrong", so mu emotions were all over the place and I wasn't saved. I didn't know I could get so angry and it didn't feel good. I really can't say what I would or wouldn't do in a situation like that. I have told myself I would never let anyone get "under my skin" like my ex husband did. ?I didn;t like the person I became due to the anger that was built up inside of me. That's probably why I'm not married today, because I'm not going to deal with any kind of foolishness from a man, respect me or leave me alone. I'm not going to let you "dibble dabble" with my emotions, life is too short. Usually the good hearted person is the one that gets hurt and ends up doing something that no one could ever believe they would do. Never say never. If a person can walk away (well run, while praying)and not say a word after seeing that "horrific" visual you described, they've won that battle at that moment. Wow, i just thought about somw "what ifs" from my past, all I can say is thank you Lord. Chuck, I can attest to what Anonymous is talking about. I was not unbalanced or my emotions was not all over the place. I excepted God in my life at an early age, but I still had my faults. I experienced the same situation like Anonymous, the only difference is I knew where my source came from, and that was through fasting and praying. Even though it was a hard pill jto sollow, it was not worth given him the satisfaction or power over me. God knew what was best for me and whatever direction he lead me through in my life, I have no regrets.